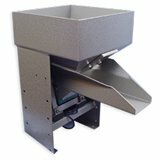 The model 5500 Series offers a stationary bin with a vibratory pan feeder mounted under the bin's discharge funnel which stores parts and delivers them on-demand. This hopper operates without the need for a direct source of electrical power and is suited to perform exceptionally well in a variety of vibratory feeding applications. In order to offer our customers a total parts handling and orienting system, we supply our customers with the industry's most reliable elevating and conveying hoppers. The general construction of these Elevator Hoppers include a storage bin, a motor driven conveyor, controls, and a mainframe. Hoppers, both vibratory and conveyor, can be equipped with an automatic level control switch (Model 8761A) to maintain a predetermined level of parts in the feeder bowl. 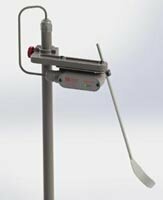 All hoppers can use an Automatic Level Control Switch (ADI Model 8651) to maintain a predetermined level of parts in the feeder bowl. This product is independent from a storage hopper and is used to remotely operate hoppers, conveyors, and other electrical devices. Automation Devices will design and engineer a hopper specific to your application. A custom designed hopper allows users to take advantage of the flexibility in designing them. 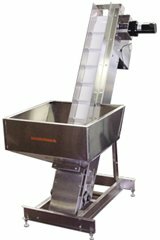 NOTE: Elevator and custom conveyor hoppers are custom designed and serve as a complementary product for parts feeding systems. These items are not available as “off-the-shelf" equipment for individual purchase. Please contact us if you would like a quote on a parts feeding system that includes an elevator or custom conveyor hopper.